Join these cool cats behind the dustbins and spin the reel on this beautifully animated 5 reel slot game by NetEnt. Match fish bones, paw prints and old glasses of milk to earn yourself some feline free spins and huge cash rewards. Pioneers for 20 years, NetEnt are all about digital entertainment. A leading provider of premium gaming solutions, they’ve been launching thrilling titles into the online slot market on a satisfyingly regular basis. Their games are as unique as their customers, and satisfy gamers of all tastes and experience with a variety of delightful online gaming solutions. Copy Cats comes complete with cool, cartoonish graphics – typical of the artistry NetEnt put into their titles. Set in a quiet, suburban neighborhood, this eclectic collection of fun felines and their favorite treats are about to take us on a ride towards fine rewards. The symbols on this 5 reel, 3 row, 25 payline online slot are 4 differently coloured paw-prints, 3 cats of different colours, cuteness, and payouts, and a collection of Fish Bones, Milk bottles, and a Wind Up Toy Mouse. Each symbol has its own rewards and charm, and each one fits seamlessly into the playful theme of this charming online game. Complete with a catchy, jazzy audio soundtrack, Copy Cats is an upbeat, delightful slot that can be played for as little as £0.25 per spin, all the way up to £125.00. While the confident Red Cat is the most valuable of the regular cats on the reels, it is the Golden Cat - partially hidden behind a giant ball of yarn - who is the Wild here, and potentially most important Copy Cat. If any of the cats land fully stacked on reel 1, a Copy Cats feature is unlocked, with all cat symbols on reels 2-5 immediately copying themselves into the same cat symbol as that stacked on 1 – so potentially every cat here can actually become wild! There is also a Free Spins feature, triggered when 3 bonus symbols appear at the same time on the odd numbered reels. 10 Free Spins are awarded, during which bonus symbols can actually double the number of Free Spins, and all cat symbols on reel 1 become Wild – making the considerably advantageous Copy Cats feature a distinct possibility again! 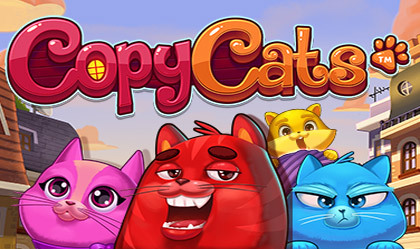 There is a lot to be loved about this online slot, from the engaging graphics to the catchy soundtrack, and when we see the Copy Cats copying each other and turning whole reels Wild, the clever theme that NetEnt have once again weaved into one of their titles becomes pleasingly apparent. It’s always a delight to see the creativity that has been weaved into an online game carry on into the gameplay, and the fun we had playing Copy Cats is certainly worth trying to repeat, or copy, again. And again. And again! With great visuals and a cheeky, strangely enticing soundtrack, Copy Cats is a game that can be enjoyed by gamers of any experience, and looking for any level of intensity. NetEnt have created a charming game, oozing with character and playability. The fun they must have had when designing the game is certainly mirrored by the fun we had playing it. 9/10.